This post is Part 2, based on that presentation. Art and science need each other. Discoveries – great and small – happen when the two come together; so give students places for cross-disciplinary work, and who knows what creative genius will flourish. Exemplifies our university as a place where traditional boundaries between disciplines are broken down, where mathematicians and engineers meet with neuroscientists and micro-technicians to envision new technologies that improve lives. 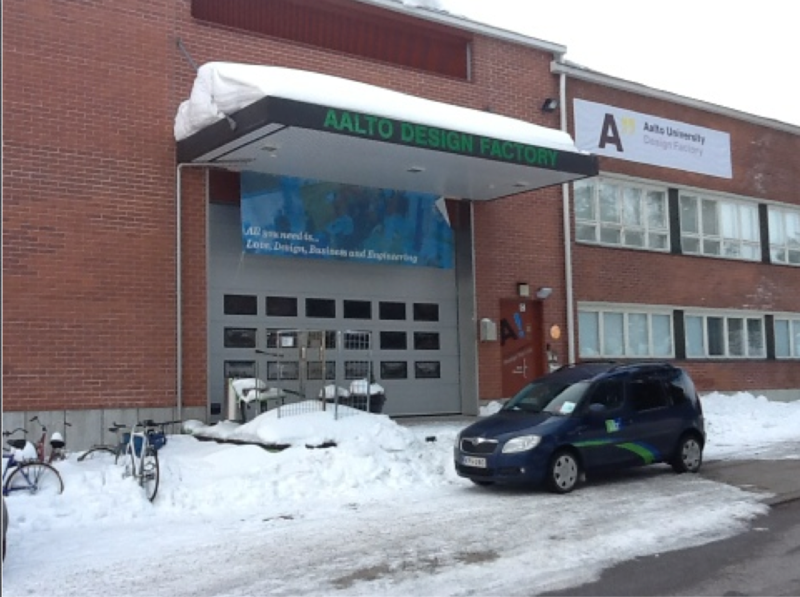 In the same way, the Design Factory at Aalto University is deliberately designed to provide a project space for the disciplines to connect. 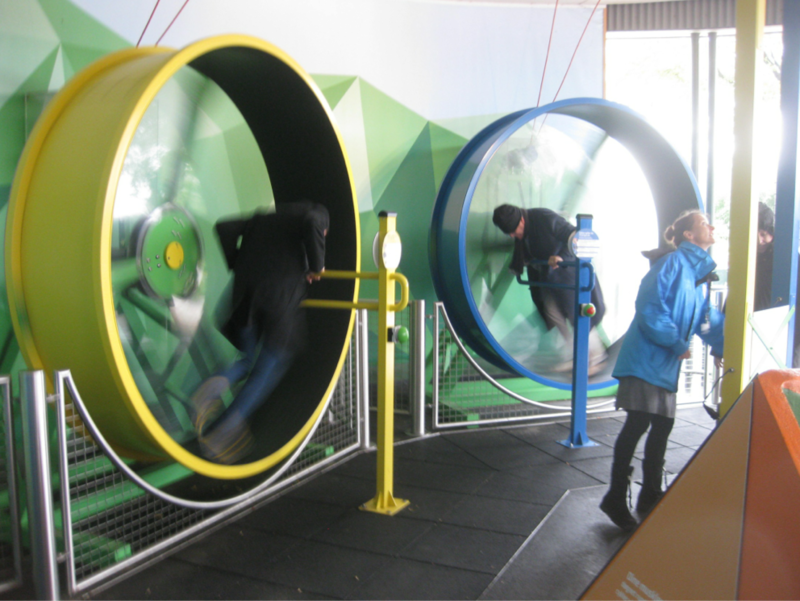 The centre is based on fun commitment and learning. 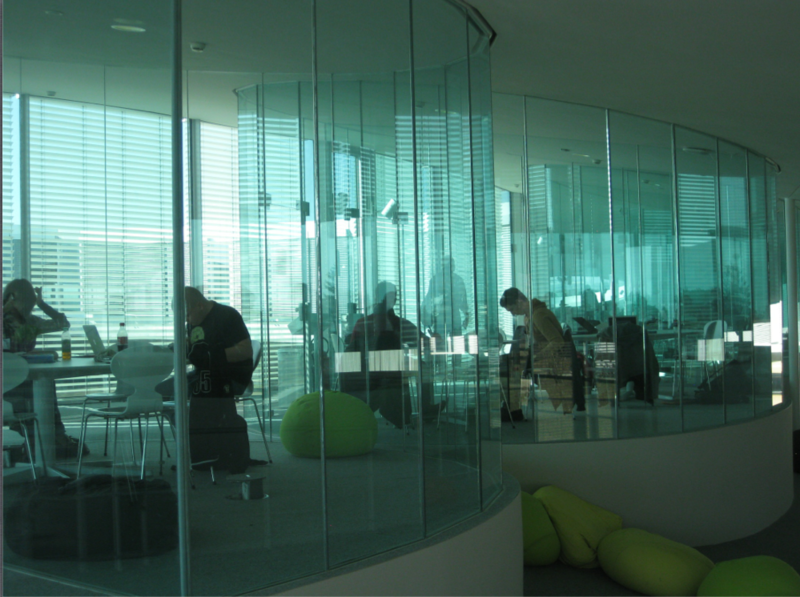 It provides a place for a collaboration environment for students researchers and business practitioners. To create a unique world class meeting places for research, development and education. Project work varies and spaces need to be used for multiple purposes. 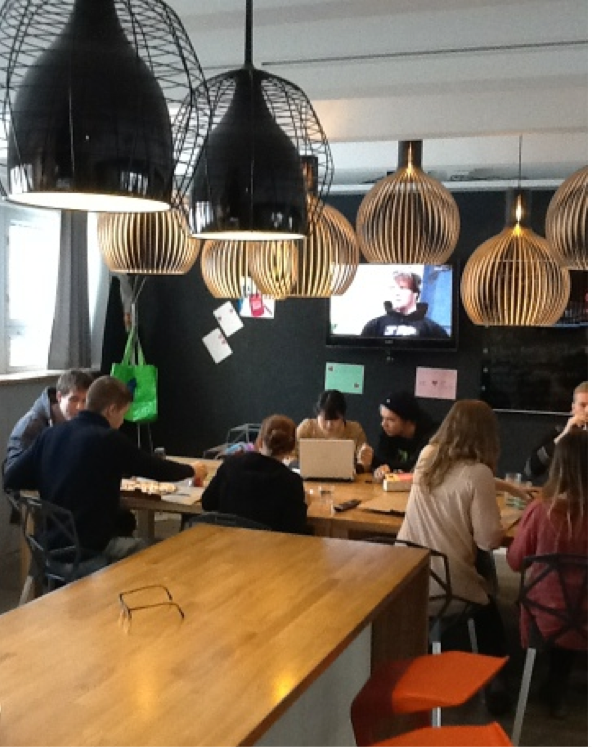 Nooks and semi-enclosed areas create places where people can work together. I interrupted a couple of students collaborating on a project – one an engineering student, the other from the business faculty. In 10 years schools won’t look like they do now. How can we think differently about how buildings are used? To develop and operate outstanding schools where students, through personalised learning and clear goals, will stretch their boundaries and learn more than they thought possible. The method is characterised by goals-setting – from short term (weekly) to long term (three years). Each student has a personalised learning plan and they know their learning style. Teachers are trained to be mentors and guides. The learning space needs to support the approach to learning. As this system grows the system leadership doesn’t look for regular school or greenfield sites, but for suitable older, unused buildings that can be fitted out. The one we visited was formerly a jewellery factory. The spaces need to accommodate the furniture design and configuration, where individual and group working spaces flow from instructional areas. School leadership that models transparency. 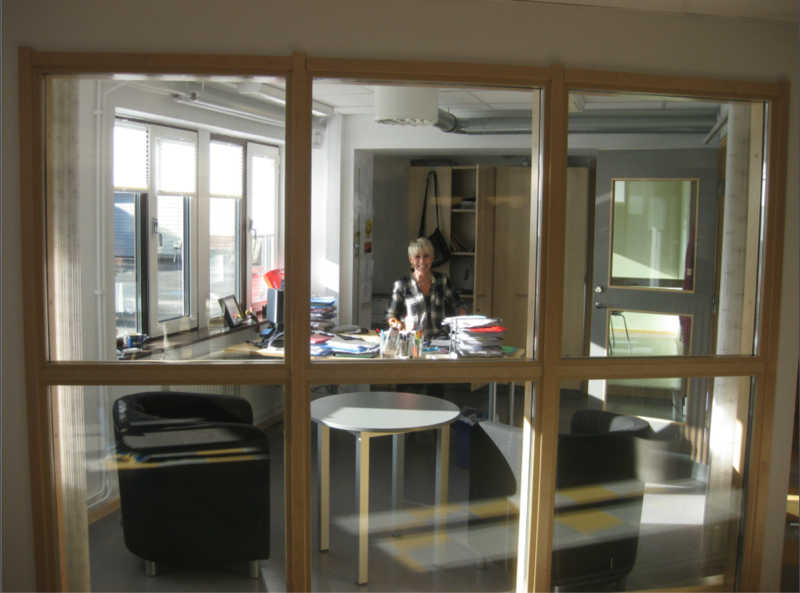 The first office and person anyone sees as they walk into the school is the principal in her ‘aquarium’, as she told us. 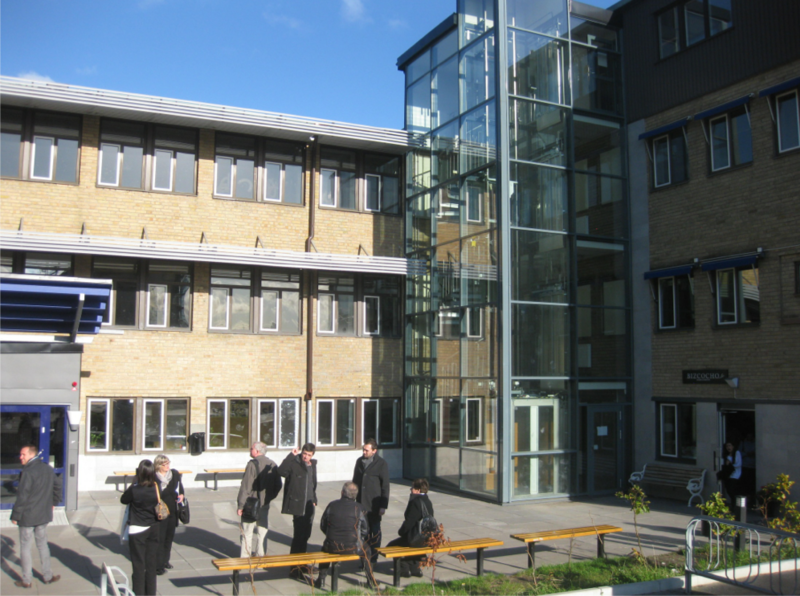 Maglegard is a K- Year 9 school in the suburbs of Copenhagen. Instead of arranging the students in three classes of the same grade, Maglegard have homebases of three classes in cross grade groupings, repeated on the different levels of the building. All students are grouped in this way. The first learning area we visited was 4, 5 and 6, about 60 children. On each level, there were three instruction spaces allocated for each class, that were connected to an open central space, shared by all classes, where they could work in groups, pairs or alone. 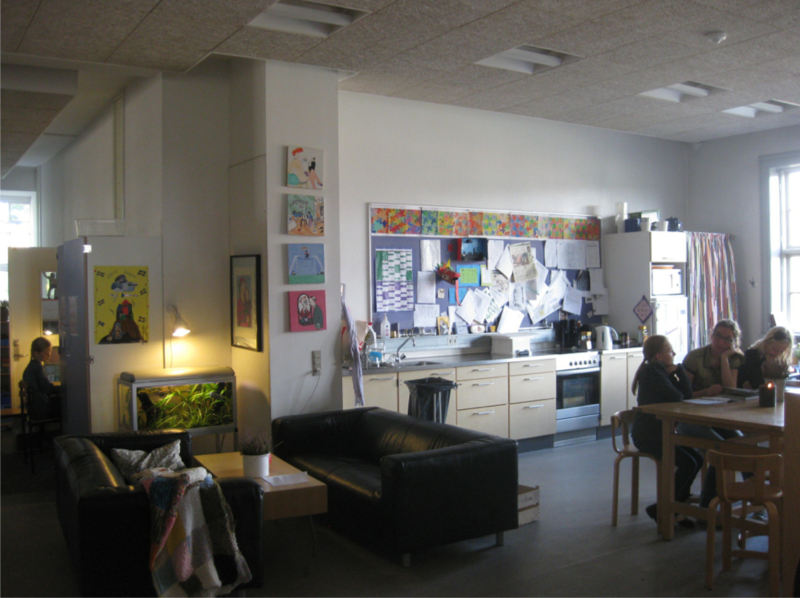 School feels like home – The shared space felt like a living room in a home. There was a kitchen with a large table and stools, sofas on a rug around a coffee table, sectioned off communal table for small group instruction, and a nook with a small table and couple of stools. 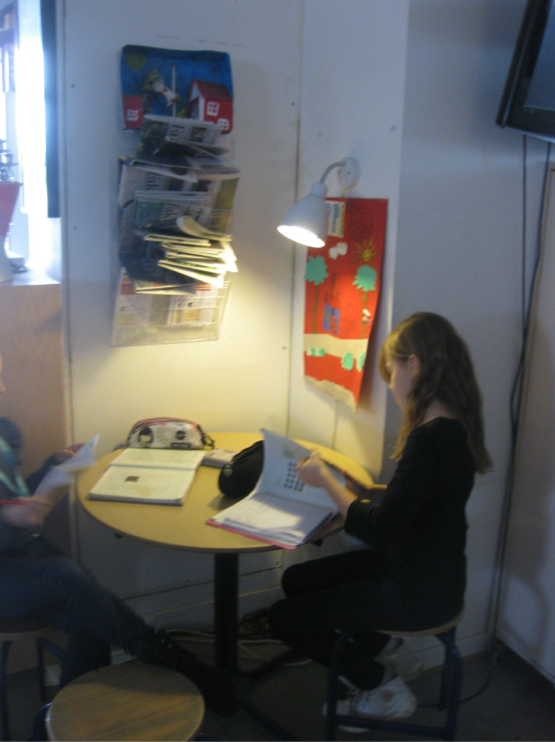 The ambience of home was also created with lamps and candles (yes, candles + children) in the true Scandinavian style. Two of the class groups were in their instruction space with their teacher, the others were choosing where to work – in the nook, at the kitchen table or on the sofa, with their feet on the coffee table. The size and furnishing of the instructions spaces discourages classes from being in their too long, the round tables with stools are just for that particular type of work. 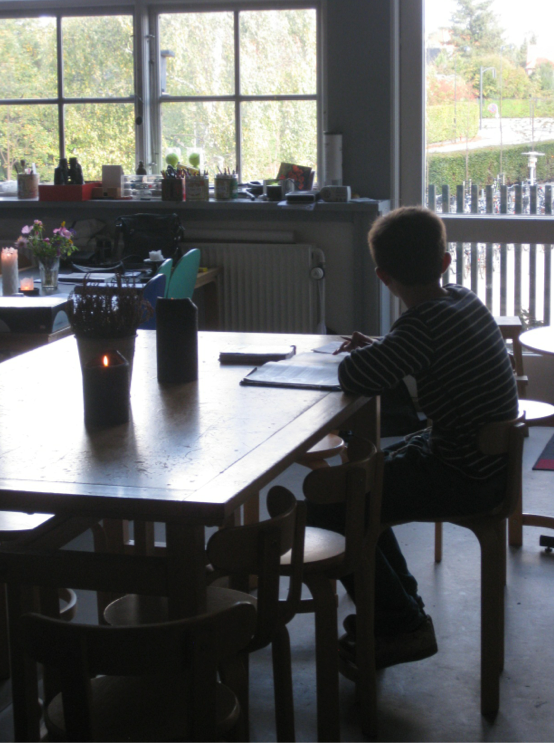 The cultural elements of Scandinavian school life add to the sense of home. At Danfoss, not just hands on, they go for body on! 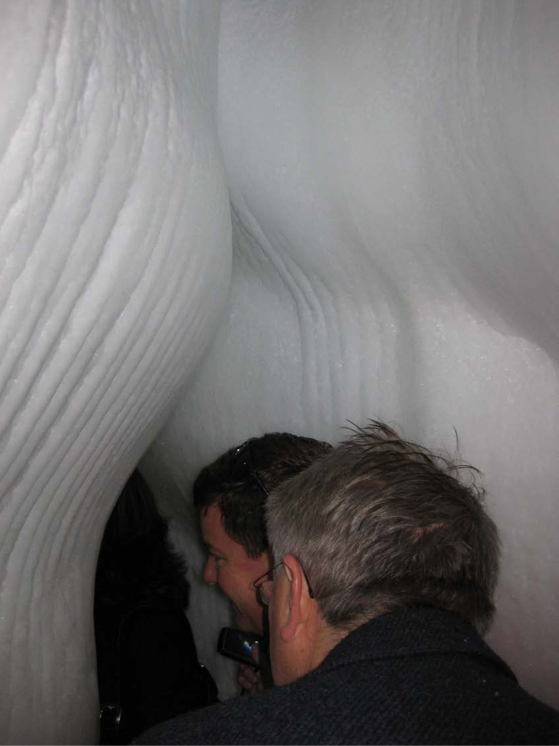 You can even walk through a glacier. 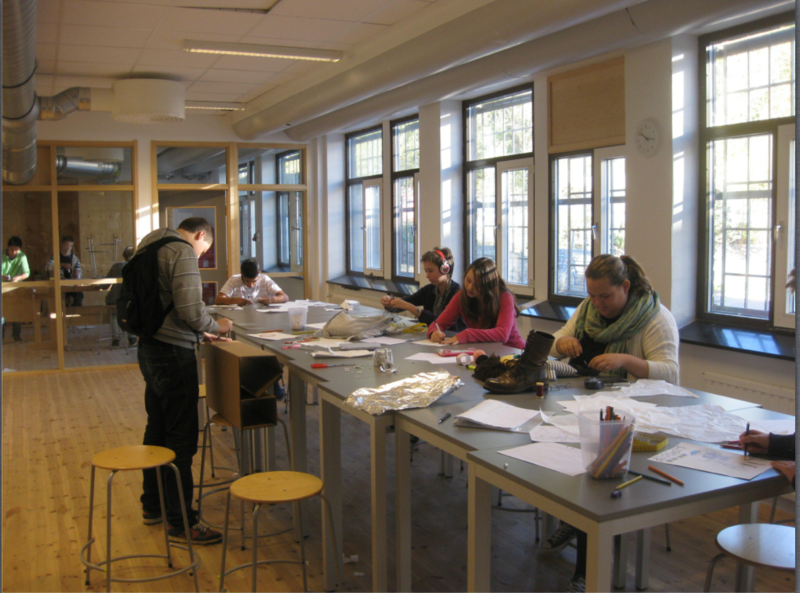 Vittra has a system of 30 schools and Preschools across Sweden. The school in Telephonplan opened just last August at the start of the school year, with a brand new teaching team working in a brand new way. Principal has thought through the design, its impact on learning and how teachers manage to engage learners in the spaces. Like our school, Vittra uses the learning space metaphors of Cave, Watering Hole and Campfire. They also use the term Show off, instead of Mountaintop and add Laboratory, to explain hands on experimental learning. There are only two defined ‘classroom’ spaces. The remaining area has zones, defined by furniture and ways of working. Many educators can see the need for change in the look and feel of school. We want to shift from segmented classrooms, subjects, classes to a learning environment that embodies the elements listed here. The more we influence, lead, speak up and disrupt the more we will be able to model change. Join us! 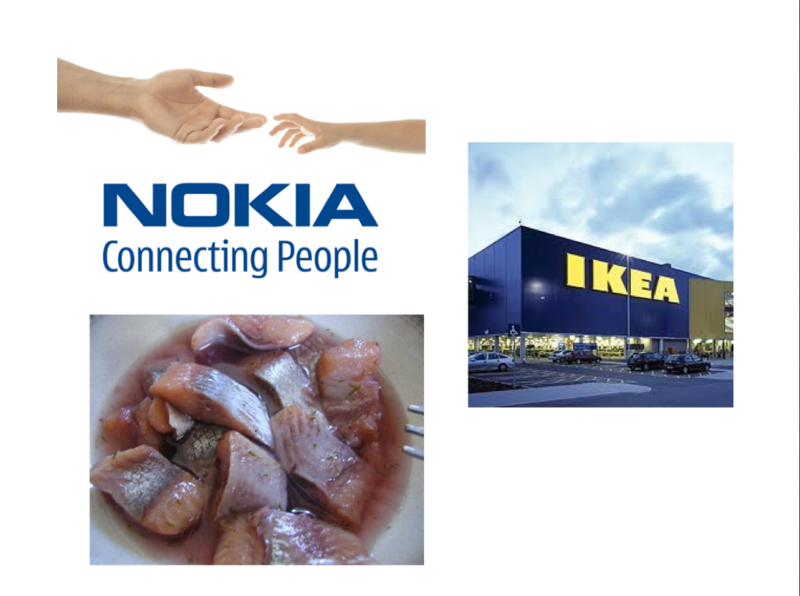 One last thing – Ikea, Pickled Herrings and Nokia? In reality, these were just a few words I put together as a catchy title for my presentation. However, as I was travelling I was thinking through their relevance. 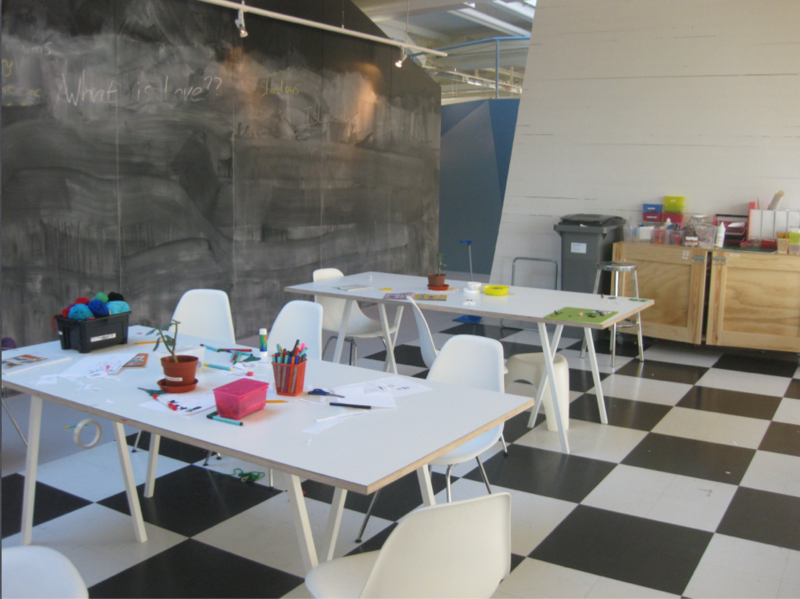 Ikea – We saw examples of replicable and scalable models of schools. One way to grow a new movement of school is to refine the ideas into a model that can be rolled out so that more schools and communities can be impacted, just like Kunskapsskolan and Vittra. Pickled Herrings – When I travel I really enjoy the food of the area and am willing to try (almost) anything. When I am staying in hotels in Scandinavia my favourite breakfast consists of rye bread, cottage cheese, smoked salmon and pickled herrings. But I am very unlikely to go out and buy pickled herrings here in Australia. In the same way, some things work in some places, but not in others. Elements of an approach in one culture just can’t be uplifted and put straight into another. Nokia – While in Finland we heard about the development of the well-known Finnish telecommunications company. About 15 years ago Nokia was ahead of the game. It was the company that put Finland on the map. But today its position in the industry is languishing. Why? 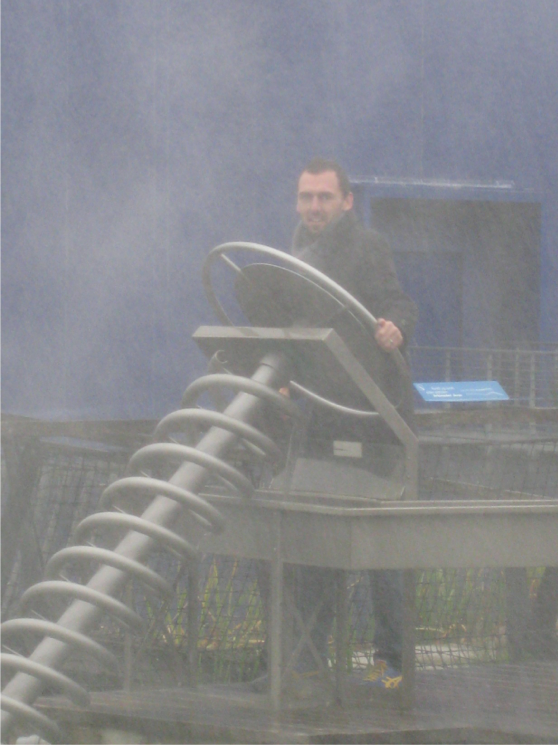 Well, according to some locals it was a company that was innovative and agile. It developed an applied new technologies quickly and brought them to market. But was technology advanced, Nokia didn’t. Its size and lack of agility made it unable to respond to the changing markets. There was no longer a simple pathway from innovative to the user. Ideas were clogged in a bottleneck. In some ways this could be a metaphor for educational innovation. Schools and systems need to be agile enough to respond to the changing educational landscape. If your school is spending large sums of money setting up computer labs in the era of the developing mobile technology environment, these labs will be expensive and difficult to dismantle. Stop now and take stock! Think future, not present. Look at what technology the young people are using and see how it can be incorporated into the learning environment.